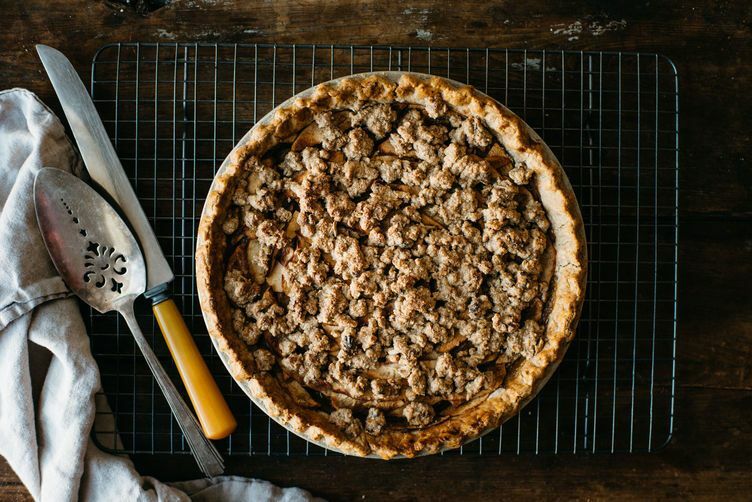 Today: Lindsey Love from Dolly and Oatmeal's gluten-free recipe will ensure that all your guests can enjoy pie this holiday season. There is nothing that dominates the holiday season quite like pie, and in my family, my mom's apple pie is quite famous -- and for good reason. Her crust is always more savory than sweet, and is at once dense and super flaky. She would use a combination of two recipes to form the ultimate apple pie that we would look forward to once the holidays rolled around. I've missed it so much that I created my own gluten- and dairy-free version, and I added a crumble topping to finish it off. Honeycrisp apples are a favorite of mine (as they are not overly sweet and they keep their form and flavor even when baked down), and I especially love them paired with freshly grated ginger, which cuts their sweetness with a pungent nudge.